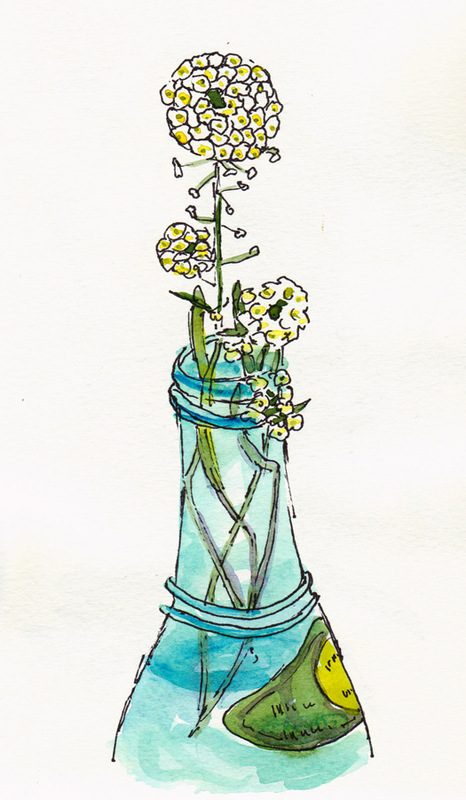 I took them home and went wild, putting them in pretty bottles and vases, then sketching and painting them all day long. My goal was to make free and fresh sketches of each flower that captured its personality while keeping composition in mind. I postponed posting because of the time it would take to prepare the many sketches, scans and photos from that glorious day. I finally made the time; I didn’t want to be posting spring wildflowers in the Fall! Do you know the names of any of these flowers? If you do, please leave a comment and tell me and I’ll change the captions with the correct names. 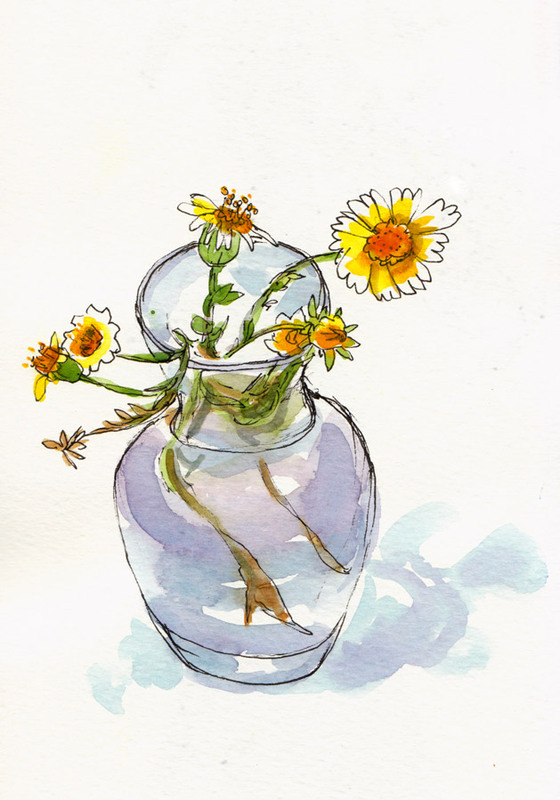 There are many more wildflower sketches to come, which I will post in Part 2. The blue ones look like cornflowers, and the pink and yellow ones could be snapdragons. Snapdragons have two “lips” you can pull apart, hence snap I suppose. I just came across a traffic island of tiny snapdragon-like flowers myself. Maybe something like this? Toadflax? There’s a whole family of flowers apparently. Jana, these flowers are exquisite. I love every one, but especially love the first two, the blue and pink ones. I am so in love with wildflowers. Thank you. Oh these are wonderful Jana! You captured them so delightfully. I think maybe the pink and yellow may be nemesia and the daisy like one looks like a variety of gallardia. But I’m no expert on California wildflowers… I could see these as a series of cards. Too bad they had to mow them down. Fantastic job! You definitely captured each flower’s unique beauty. You’ve got a book in the making! 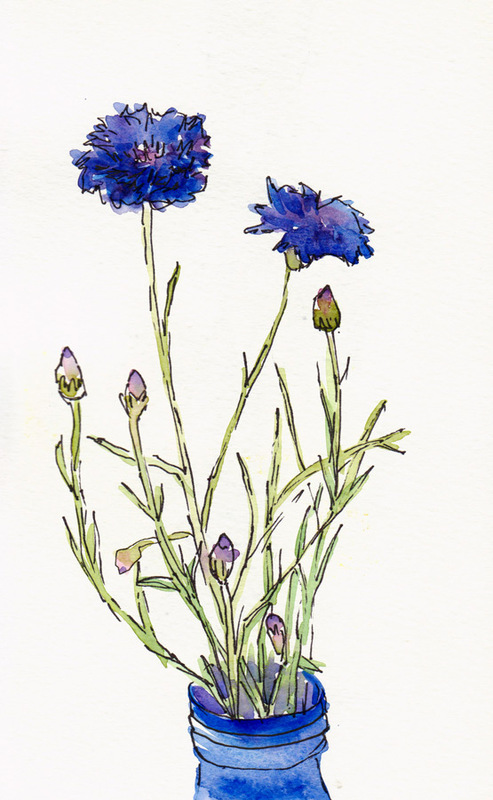 I really enjoyed your post and each photo of your wildflowers and your drawings of said flowers. Each was really beautiful. Sorry I can’t help you on the names. 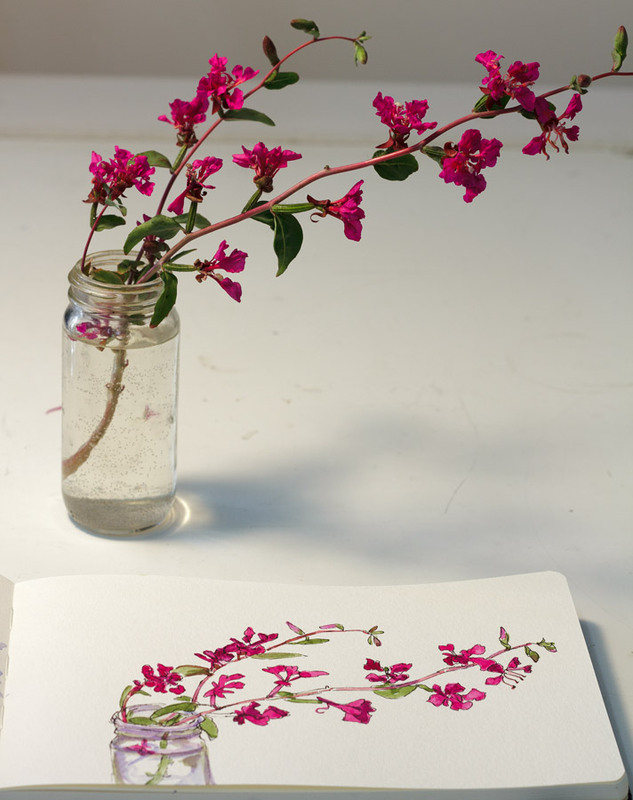 Yes, I agree that these wildflowers would make a beautiful book! Love these sketches! 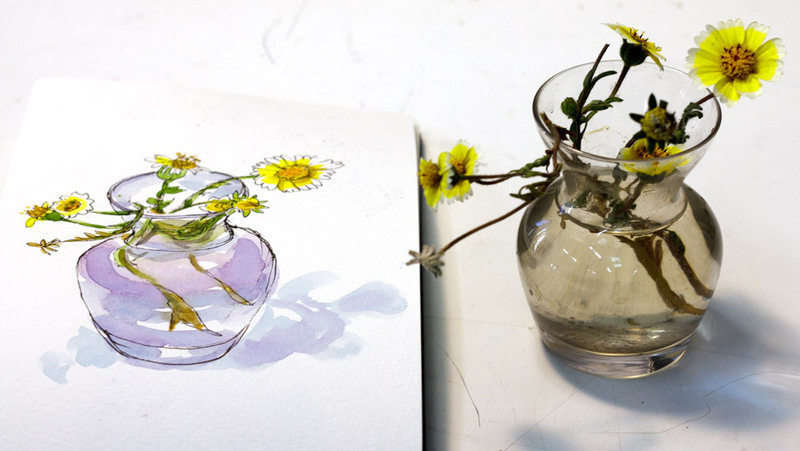 Lovely, delicate sketches! So wonderful that you captured them before their demise. You got the bachelor’s buttons, or cornflowers right. 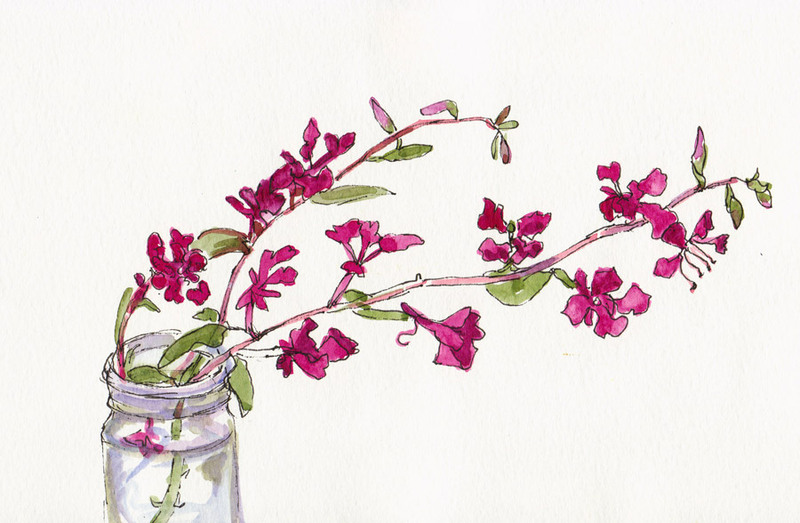 I think the second one is Clarkia. 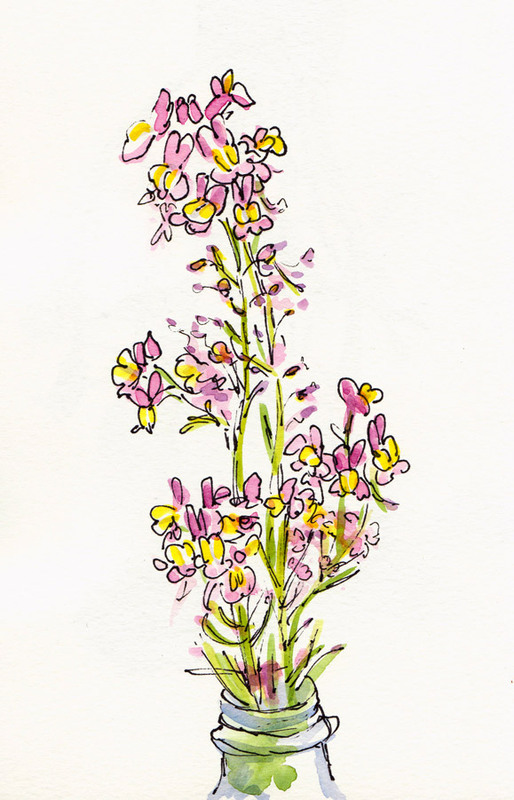 The third is Linaria, Toadflax related to Snapdragons – maybe Moroccan Toadflax? The fourth is Gallardia, Blanketflower. The last is Lobularia, Sweet Allysum.